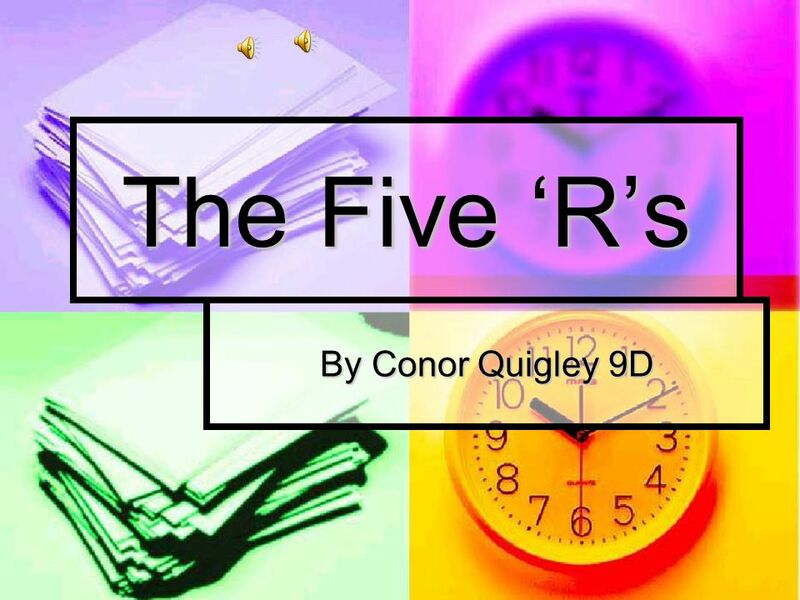 The Five Rs By Conor Quigley 9D Respect Respect We do not treat the world with the respect it deserves. We take advantage of it and do what we please. 3 Respect Respect We do not treat the world with the respect it deserves. We take advantage of it and do what we please. People need to change their attitude and their actions. We do not treat the world with the respect it deserves. We take advantage of it and do what we please. People need to change their attitude and their actions. 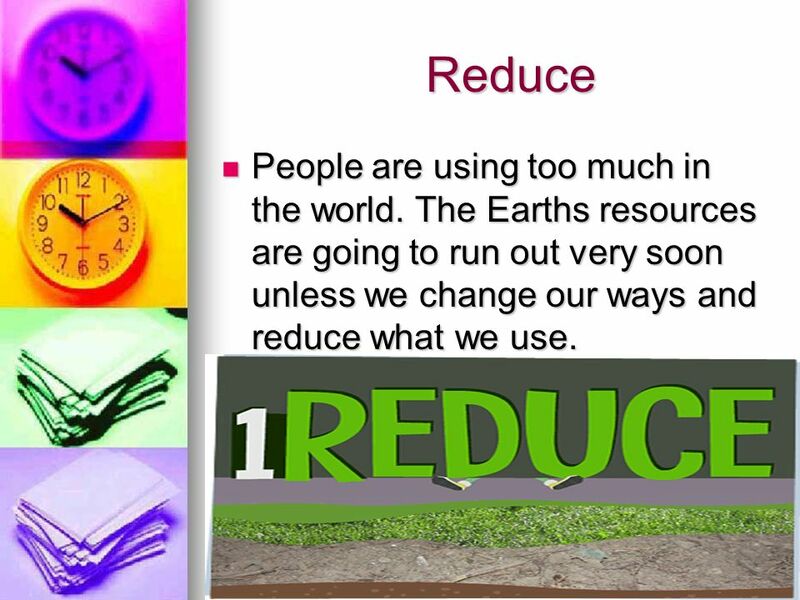 4 Reduce Reduce People are using too much in the world. The Earths resources are going to run out very soon unless we change our ways and reduce what we use. People are using too much in the world. The Earths resources are going to run out very soon unless we change our ways and reduce what we use. 5 Recycle Recycle People throw out more than they need to. Almost everything can be recycled. We need to look after our earth and put a halt to our litter problems. People throw out more than they need to. Almost everything can be recycled. We need to look after our earth and put a halt to our litter problems. 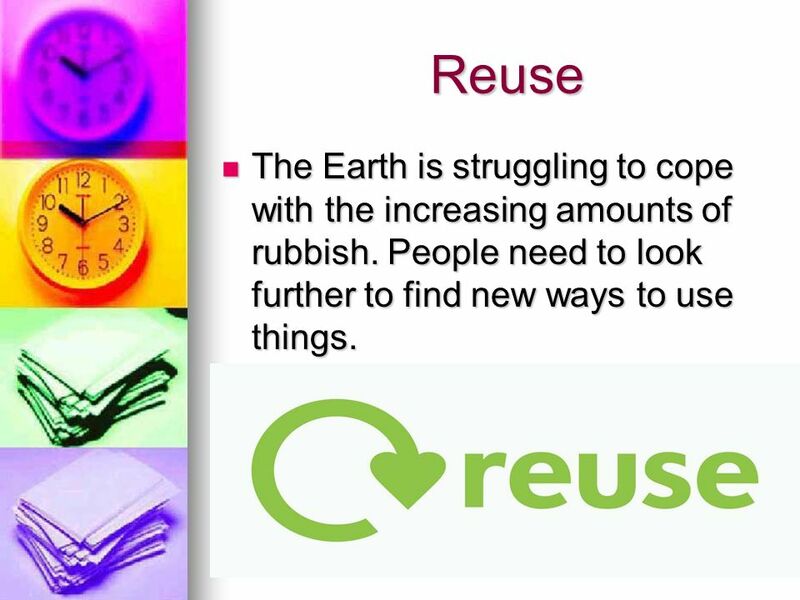 6 Reuse Reuse The Earth is struggling to cope with the increasing amounts of rubbish. People need to look further to find new ways to use things. The Earth is struggling to cope with the increasing amounts of rubbish. People need to look further to find new ways to use things. 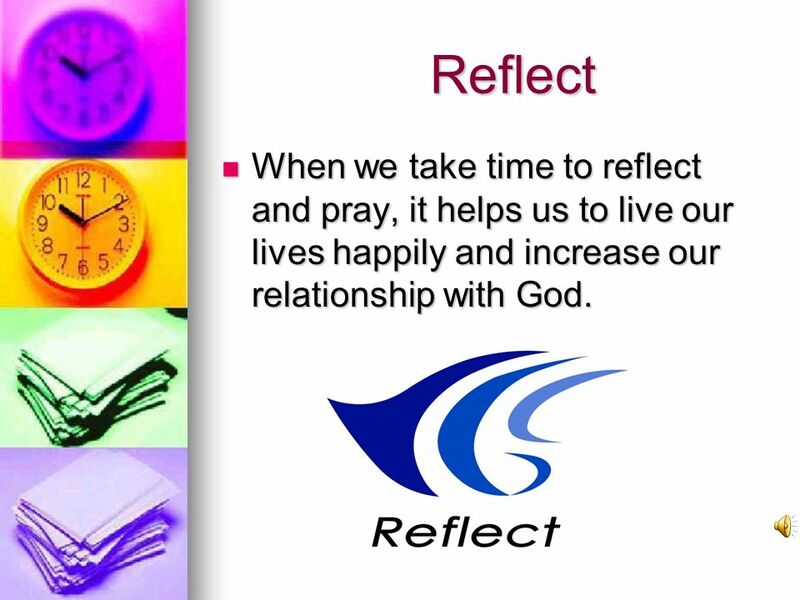 7 Reflect Reflect When we take time to reflect and pray, it helps us to live our lives happily and increase our relationship with God. When we take time to reflect and pray, it helps us to live our lives happily and increase our relationship with God. 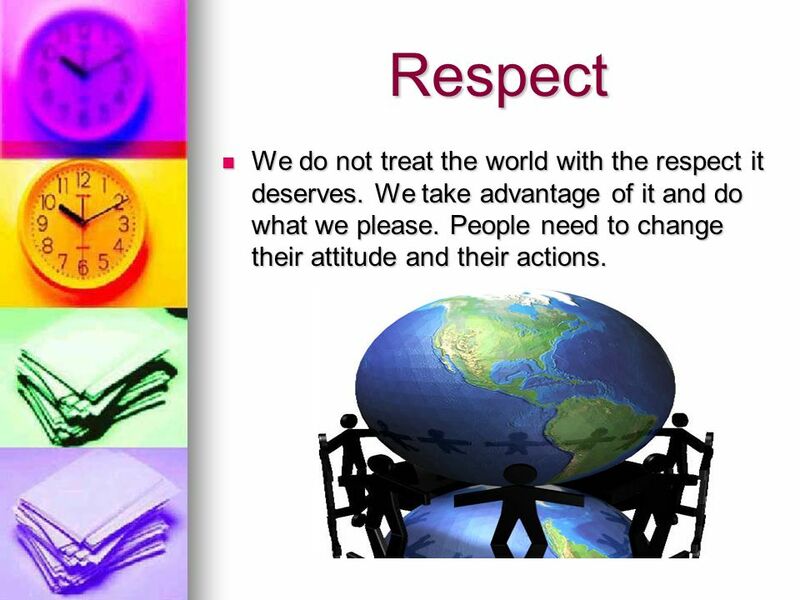 Download ppt "The Five Rs By Conor Quigley 9D Respect Respect We do not treat the world with the respect it deserves. We take advantage of it and do what we please." The 5 Rs Dylan Taylor 9D. espect Humans today exploit the Earth. They live as if being in charge of it means doing what they please with its resources. The 5 Rs by Ruairi Doherty 9D. Respect: humans today exploit the earth, they live as 9f being in charge of it means doing what they please with its resources. Humans today exploit the earth.Humans today exploit the earth. They live as if being in charge of itThey live as if being in charge of it Looking after. What do you know about the materials we can find and use on the Earth? Why pack a waste-free lunch? You will feel great about helping the earth by reducing the garbage you throw away. To keep your school yard cleaner and. LITTER. 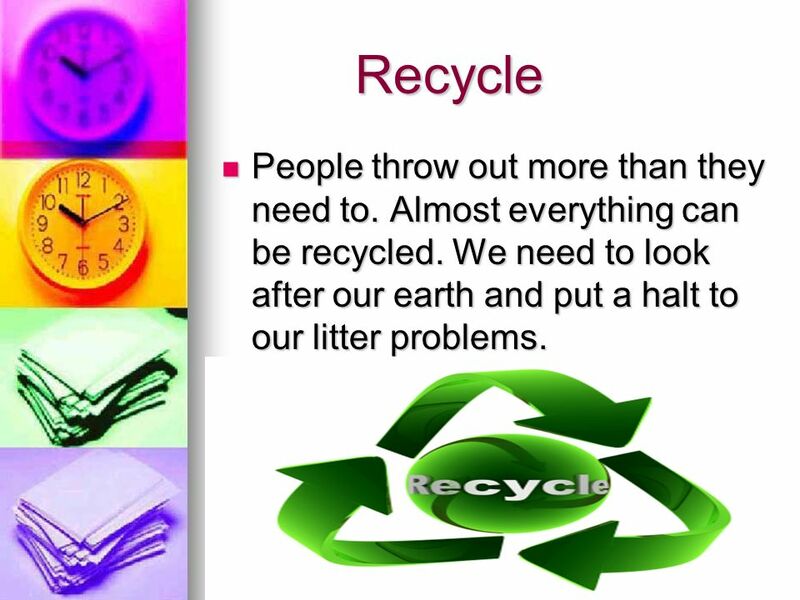  The Typical American throws away about five pounds of trash a day. ‘Respect your school, don’t drop litter.’.  This week, in our forms, we would like you to think about ways to care for our school environment. One way. How can we save Energy Make sure we turn the lights off when we are finished in the class room. Shut doors and keep windows closed when radiator is. Waste Audit Carried out on 21 st August. The weight of 1 day of normal school rubbish was kg The General Rubbish. November 2013 What is EWWR? EWWR is a European Union-wide initiative It encourages people to produce less waste EWWR runs. Time Remaining 30:00. 29:30 29:00 28:30 28:00. Reduce, Reuse, Recycle and Respect Reduce To reduce the size, number, or use of something is very important. To reduce the size, number, or use of something. SAVE OUR EARTH SAVE OUR PLANTS By Ms. Joy. We cannot live without plants. Recycling Plastic Problems and Solutions. Problem: Too much trash!  All our trash has to go somewhere.  It goes to dumps and landfills.  We will run. By Natasha Bellizia 2T. Please recycle because it will send less to landfill and we will get new stuff out if recycling. Moral Decision Making See, Judge, Act, Evaluate.